Given that I have long term inflammation issues, a friend of mine gave me a recipe using turmeric powder. This is a natural anti-inflammatory and has been used for over 3000 years to treat arthritis in Chinese medication. The recipe she shared with me used milk as a base. This was warmed with coconut oil, turmeric, black pepper, cinnamon and vanilla and once warm poured into a mug. I also tried it with ginger and nutmeg. Honey was stirred in for sweetening, and despite adding more honey than was recommended, I could not stomach the taste of the turmeric. I turned to Margaret Roberts’ Tea book for inspiration and she makes note that you should not drink turmeric every day. I would suggest having a cup every second day, or if the need is greater, every weekday. The recipe in the book makes use of ingredients I could not source, other than the aniseeds which I bought to make my herbal infusion. Aniseeds are great for lung issues, and as I had a bit of a post nasal drip I decided to add these to what inspired me from the milk recipe. Basically I took the best of everything to make something that tasted great! Tumeric is so good for health and I use it in my cooking for curry dishes. I never thought of making tea. What a great idea! Turmeric is good for so many things. I will be trying this out on the weekend! I would love to try this tea!! When we are in Bali I always see the locals drinking a cold tumeric root drink but I have never tried it. The ingredients in your tea look so flavoursome! 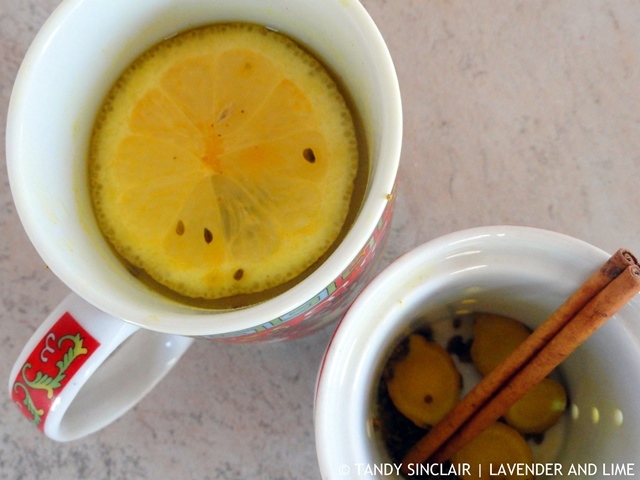 I’ve been skeptical of trying turmeric tea, but now I think I have to! What a gorgeous tea and perfectly spiced! Turmeric tea sounds and looks awesome. Addition of ginger root is amazing here! Are you having good success with this? This sounds good, Tandy. I tried the turmeric milk drink and felt really unwell afterwards. I wonder if it was the milk Liz? Hi Tandy, this drink sounds very warming, looks delicious! I had no idea turmeric powder had inflammation properties within it. I definitely have some things I can use this with. Thank you for posting this Tandy. Turmeric is amazing for so many ailments. I made my own tincture so I have a huge bottle. I keep meaning to make a tea so thanks for this recipe, aniseed will be good for the allergies. Have you blogged the tincture recipe? I didn’t realized that turmeric was a a natural anti-inflammatory. The tea sounds wonderful. I’ve been hearing so much about the benefits of tumeric lately and this looks like a great way to start the day! Will have to try this – am battling tonsilitis right now 🙁 much prefer the idea of a tea made with boiling water rather than milk. What a very flavourful cup of tea Tandy. Must say tumeric isn’t my favourite since a friend gave it to me in a flu concoction years ago.